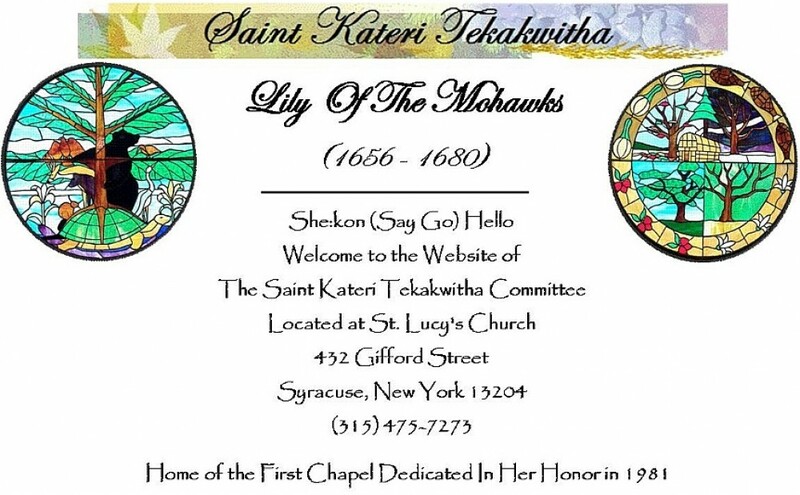 St. Kateri Tekakwitha was born in 1656 the daughter of a Christian Algonquin mother and a non-Christian Mohawk Chief, on the south bank of the Mohawk River in the Village of Ossernenon. When she was four years old, a smallpox epidemic claimed the lives of many of the Native Americans, including Kateri’s parents and younger brother. Although she survived the disease, she was left very weak, with impaired eyesight and a scarred face for the remainder of her life. About five years after the epidemic, the survivors of the village moved to the Turtle Clan Village of Kahnawage (Gah-na-wa-gay) to begin a new life. Kahnawake is located on the north bank of the Mohawk River and is now called Fonda, New York. Kateri first met Fathers Fremin, Bruyas and Pierron in 1667 when they came to the village on a mission to spread Christianity. Kateri showed great interest in the Black Robes, remembering her mothers teaching from the time that she was a small child. In 1670, a Mission was established in the village and a Chapel was built inside one of the longhouses. In 1674, Fr. Jacques De Lamberville took charge of the Mission. Kateri met Fr. De Lamberville a year later when he visited her home. At that time, she expressed her desire to become a Christian and be baptized. She began religious instructions and on Easter Sunday, April 5, 1676, she was baptized and given the Christian name, Kateri or Katherine. On Christmas Day, 1677 Kateri received her First Holy Communion. Kateri became friends with a girl named Mary Teresa (Tegiaguenta/Day-guy-ya-gwan-dah) and both performed extraordinary penances. They eventually requested permission to start a religious community, a request that was denied. In 1678, Kateri was enrolled in the Pious Society called The Holy Family, because of her extraordinary virtues. On March 25, 1679, at the Feast of the Annunciation, a moment after receiving Holy Communion, Kateri pronounced her vow of perpetual virginity. From that time, her entire life was devoted to teaching prayers to the children as well as comforting and caring for the sick and elderly. Kateri became ill on Wednesday of Holy Week, April 19, 1680 and died at 3 o’clock in the afternoon, at the age of twenty-four. Her last words were “Iesos Konoronkwa” meaning “Jesus, I love You”. Favors and miracles obtained through her intercession began almost immediately. On January 3, 1943, Pope Paul XII declared Kateri Tekakwitha venerable. Pope John Paul II Beatified her on June 22, 1980. 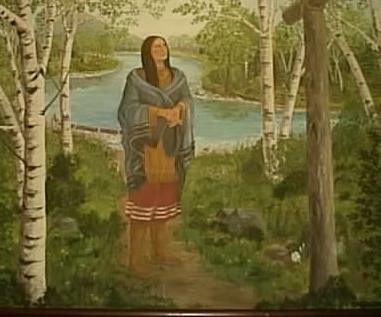 On December 19th, 2011 Pope Benedict XVI decreed Kateri Tekakwitha a Saint. On October 21st, 2012, Pope Benedict XVI Canonized Saint Kateri Tekakwitha.